Rudolf Hess (or Rudolf Heß) (1894-1987) was a high-ranking figure in the Nazi party and German state under Adolf Hitler. He was Deputy Führer from 1933 until 1941, when he left Germany on a mysterious flight to the United Kingdom, Germany's enemy in the ongoing World War II. There is still speculation and conspiracy theories about exactly what he was up to. Regardless, he was imprisoned and in 1946 convicted of Conspiracy and waging aggressive wars, spending the rest of his life in Spandau Prison near Berlin, where he died of suicide in 1987. At least that's what they want you to believe. 3 Why did he fly? Hess was born in Egypt to a German merchant family in 1894. In 1900, he was sent to boarding school in Germany, later studying business in Switzerland for and taking up an apprenticeship in Hamburg, with the intention that he would join the family firm after a suitable training. He served in World War One from 1914, seeing action in several battles and being awarded the Iron Cross, Second Class. He trained as a fighter pilot but the war ended before he could see dogfighting action. After the war he joined the Thule Society, an eccentric right-wing group with ethnic-based politics, and the Freikorps, a far-right paramilitary group who combatted communists in street violence and small-scale putsches. In 1919 he enrolled at the University of Munich, studying history and economics under Karl Haushofer, early proponent of Lebensraum (stealing land for Germans). Hess heard the young Hitler speak in 1920 and became an avid follower, becoming one of the earliest members of the NSDAP (Nazi Party) on 1 July 1920. He used his Freikorps experience to help organise the SA (Sturmabteilung), the Nazis' paramilitary wing, and was jailed after the 1923 Beer Hall Putsch. In 1925 he became Hitler's private secretary, when both were released from jail, and after Hitler became Chancellor in 1933, Hess became his deputy, with significant administrative responsibilities and an important party role including work organising the Nuremberg Rallies. Since Hess was a loyal lieutenant and able administrator, the most intriguing thing he ever did was get in a plane on 10 May 1941, and fly on his own to Scotland. Scotland, as part of Britain, was at war with Germany. Hess's plane apparently experienced problems and he parachuted out, sustaining significant injuries. He landed south of Glasgow, where he gave a false name and asked a farmer (David McLean) to take him to the Duke of Hamilton. Hess was detained and interrogated, insisting he wasn't the Deputy Führer, but asking to see Hamilton. The Duke was brought to meet him, and Hess immediately confessed all. For the rest of the war, Hess was imprisoned in various English locations, including briefly at the Tower of London. As well as medical treatment for his injuries, he was examined by psychiatrists who found his mental state was poor, making claims that he was being poisoned by his guards. He attempted suicide twice. 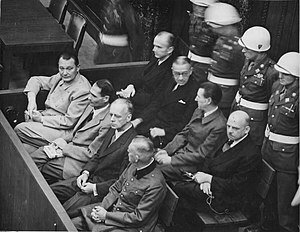 After Germany's surrender, he was sent to Nuremberg for the war crimes trials and was convicted of crimes against peace and criminal conspiracy, with a sentence of life imprisonment. The dominant theory was that he intended to meet Douglas Douglas-Hamilton, the 14th Duke of Hamilton, a supporter of appeasement who had met Hess multiple times before the war and had known pro-German sympathies. Before and during the war, there were elements in the British establishment that were sympathetic to Nazism, Hitler, and Germany, including the Duke of Windsor (briefly King Edward VIII before his abdication in 1936). Questions have been raised about whether Hess was on a mission from Hitler, and whether that mission was to organise a fifth column (planning to depose Churchill or take over from him in event of a German invasion) or to negotiate peace. On the other hand, Hess may have realised Germany was doomed and tried to defect. It has been suggested that Hess was feeling increasingly sidelined by Martin Bormann at the time of his flight, deprived of influence over Hitler who was taking direct control of the war and ignoring all other matters; Bormann took over from Hess as deputy after he flew. So possibly he was acting on his own initiative. On the other hand there are also claims that Hess was carrying documents setting out a peace deal from Hitler, suggesting his mission was officially sanctioned. He landed 6 weeks before the Nazi invasion of the Soviet Union, so it would have been a good time to negotiate a swift peace and allow the Germans to concentrate their efforts eastwards. It's even been suggested that Britain may have colluded in the attack on the Soviet Union, thanks to Hess's arrival. One of the more bizarre theories is that the Hess imprisoned at Spandau was not the real Hess who had been chums with Hitler. The book Double Standards: What Really Happened To Rudolf Hess? by Lynn Picknett and Clive Prince claimed the British imprisoned a double for Hess while the real Hess was involved in negotiating peace; supposedly Hess and Prince George, Duke of Kent (another member of the royal family with a fondness for Germany) were on a secret peace mission when the latter was killed in a plane crash in 1942, and the real Hess also died then. Hess killed himself by hanging on 17 August 1987. A note to his family was found in his pocket. However, there are claims that he was actually murdered. Why would people kill him 46 years after his capture? According to a report by Detective Chief Superintendent Howard Jones, released under the Freedom of Information Act, British military surgeon Hugh Thomas had examined Hess and deduced that he was an imposter, because his medical examination did not match injuries Hess was known to have received in World War One or later. Supposedly Hess was murdered to prevent him spilling secrets about a plot to depose Churchill and replace him with Germanophile aristocrats. The government of the USSR was reluctant to have Hess released, because he would reveal secrets the Russians wanted hidden. It's also claimed that he was killed because Gorbachev was planning to reverse this policy and release Hess, so he would have to be killed by the British or Americans to keep him from revealing secrets. Hess hanged himself from an anchor point just 5 ft above the ground. But it's entirely possible to die of asphyxiation this way, as Hess apparently did. He was too weak from arthritis to tie the noose and hang himself. The note was apparently written 20 years before. Theories of murder were also advanced by Jan Needle in a novel Death Order. ↑ 1.0 1.1 1.2 1.3 See the Wikipedia article on Rudolf Hess. This page was last modified on 13 March 2019, at 12:59.